Thai motorists now have a choice of a CNG/petrol bi-fuel version of the Toyota Hilux Vigo Champ when shopping for pickup trucks. The 2.7 litre vehicle is factory fitted and carries a full OEM warranty. Buyers can choose between a single cab or dual cab version. In both cases the CNG cylinders are located in a purpose built compartment in the cargo bed. Toyota also supplies a bi-fuel Corolla sedan in Thailand. More information: NGV Global News item on CNG Toyota Hilux in Thailand. Thailand is a net importer of oil. The energy consumption is about 1.8 million barrels per day (last 5 years CAGR = 6%) and is expected to be around 3 million barrels per day by 2015. Oil is the main source of energy in Thailand (47% of the total energy consumption), about 67% of which is consumed by transportation sector. As a result, the high price of crude oil in the world market nowadays has a great impact on motorists and the country’s economic expansion. There are about 38.24 TCF of natural gas reserves in Thailand (including the reserves in the Thailand-Malaysia Joint Development Area; JDA). Natural gas has increased steadily its share of energy supply from 14% in 1992 to 28% in 2004, which amounts to 3,000 MMSCFD (million cubic feet per day) or the equivalent of 515 thousand barrels per day of petroleum oil. Like many countries around the world which have indigenous natural gas reserves, the Thai government has strongly promoted alternative fuels since 2002. Gasohol, bio-diesel as well as natural gas have been selected to be major alternative vehicle fuels to reduce the impact of the high oil price. Among these, natural gas is the most favorable fuel because it can replace 100 % of oil usage. Furthermore, it generates better tail-pipe emission than diesel and gasoline. Since 1984, NGV has been developed in Thailand mainly for the emissions reduction in Bangkok area. 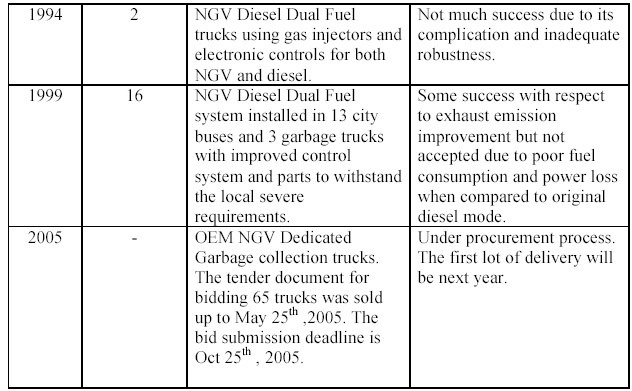 The long history of the development of NGV for use in heavy-duty vehicles is summarized in the following table. The above table shows that PTT has been working very hard in trying many conversion technologies, starting from the cooperation from New Zealand’s government in 1984. 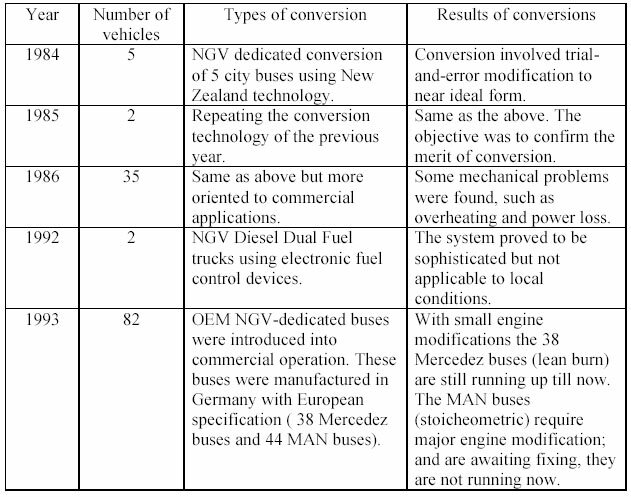 Five in-use public buses of the Bangkok Mass Transit Authority (BMTA), Isuzu 6 BD1, Hino EH100, Isuzu DA125, Hino EH700 and Mercedes Benz OM360 have been converted to use NGV for demonstration purposes. 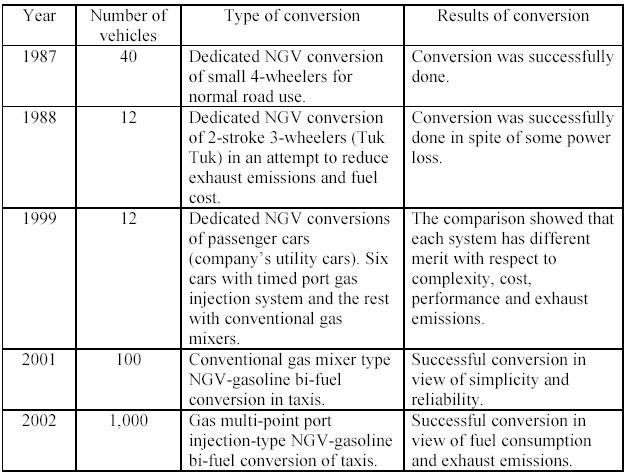 There have been 3 other trial projects involving the conversion of in-use buses and trucks to dedicated CNG and diesel/CNG dual fuel (DDF) operation by using a simple gas mixer. These trials proved unsatisfactory to the fleet owners in terms of fuel economy and drivability. As a result of poor performance of the in-use converted buses, in 1993 the Thai government decided to give a grant to BMTA for the purchase of 82 OEM dedicated CNG buses (44 MAN & 38 Mercedes Benz) while PTT invested in a CNG refueling station to service these buses at their depot. This scheme was aimed at promoting NGVs as a means of tackling air pollution problems in the capital. Although they have proved to be satisfactory in general, some technical problems occur due to the incompatibility of NGV quality in Thailand. These problems have been partially solved while the rest is underway. In view of the economy at that time, the fleet has proved to be not so attractive but in view of exhaust emission it has been proved to be a success. In 1997, there was an economic crisis in Thailand, the Thai Baht was devalued, but the crude oil price was still relatively high. The Thai government has gradually removed its oil price subsidy for both diesel and gasoline. The NGV project was reestablished to promote natural gas as an alternative vehicle fuel to alleviate the impact of the high oil price as well as addressing the environmental problems in the greater Bangkok area. Therefore PTT, as a state owned agency, turned to focus on in-use vehicle conversion again in 1999. The pre-marketing demonstration project was set up by converting 16 city buses to NGV, using the diesel dual fuel system. – Conversion technology is a crucial factor. Our experience is that simple gas mixer conversion technology is prone to pre-ignition in the intake manifold. Since a vacuum-control gas mixer was used for pre-mixing of gas and the intake air of the engine, the intake manifold was therefore filled with combustible gas, which was believed to be the cause of detrimental misfiring. The engines had been converted from diesel to spark ignition, with a resulting increase in the combustion temperature. The increased combustion heat was not removed by additional cooling provision, such as increasing radiator capacity, therefore the engine would naturally operate at a higher temperature and be prone to pre-ignition. The converted engine power obviously dropped to about 25-30%. however this has to be done very carefully to prevent the piston burn-out. Its tail-pipe emission contains lower PM10 than the original diesel engine. – In-use engine condition is highly dependent on the converted engine performance, it depends on the way of use and maintenance. – CNG quality: natural gas that contains a high percentage of methane will inhibit pre-ignition whereas the percentage of inert gas ie CO2, N2 will affect engine performance. Not only heavy-duty vehicles were developed for NGV but also light-duty vehicles as well. The history of the development may be tabulated as follow. gas-mixer type, but it costs more. Most cars in Thailand have the electronic fuel injection type engines, therefore the injection type conversion seems to be a proper technology for our cars because it can eliminate miss-firing problems. The gas mixer type can be equipped with a pressure relieve device to vent back pressure caused by backfire. PTT is preparing to publish information on all conversion technologies, the engine performance, emissions and costs of each conversion technology. This will be useful information for vehicle owners to choose what conversion technology is suitable for their application and their ability to pay. The above survey results give PTT full confidence in expanding after market taxi and car conversions. Along with the development of NG vehicles, refueling facilities have also been established to support those vehicles. The corresponding history of NGV refueling station establishments is listed in the following table. – 34 NGV Service Stations and 10 more stations are under construction. NGV Price now is 8.50 Baht/ kg (as of 15th June 2005) when compared to other fuel on an energy basis. 1. NGV service station network: The network should cover the area where NGV users are. 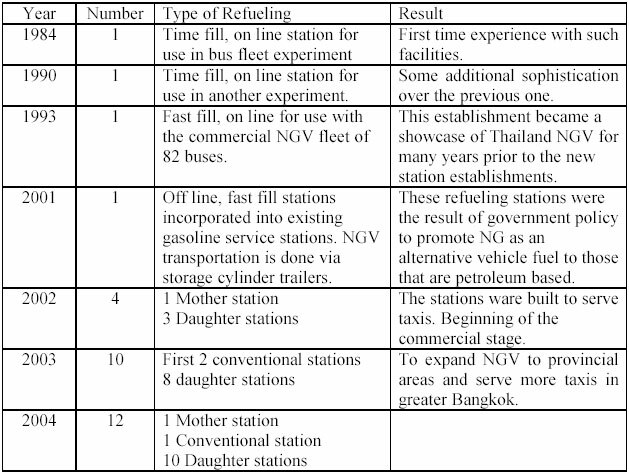 There are Thai regulations for the design and construction of CNG refueling stations which are adopted from international standards. Safety and quality control are of crucial concern. If there were to be any accident, such as CNG tank explosion, this definitely would scare people away from using NGV. mechanic shop and convenience store etc. 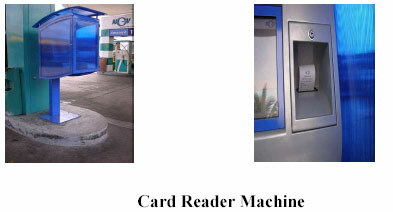 This creates benefits in terms of drawing more people to buy products in convenience stores and mechanic shops. However the incentive for investment i.e. corporate tax exemption, low rate on government land lease etc. is still required to reduce the station cost and attract CNG service station investors. when using the converted engine. further benefit for NGV owners. 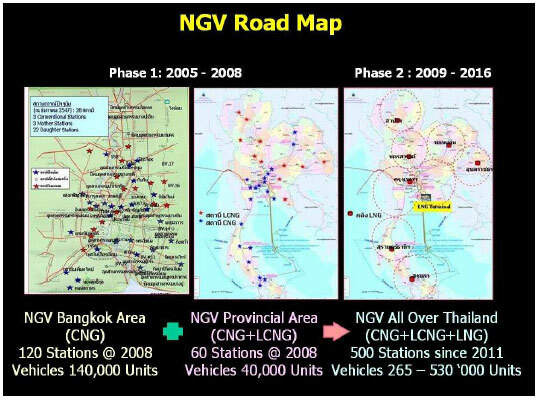 There are 2 phases in the implementation of NGV in Thailand Phase 1 (Present – 2008) PTT will expand NGV and CNG refueling infrastructure focusing on the greater Bangkok, provincial areas along the natural gas pipeline route and along super highways. PTT aims to use NGV to replace 10% of diesel and gasoline usage. The numbers of NGV and refueling stations are expecting to be 180,000 units and 180 stations respectively by the year 2008. A new distribution natural pipeline from the new international airport, Suwanapoom airport, to inner Bangkok, Pratum Num area, will be constructed by the end of this year, and will be extended to PTT ‘s energy complex in Ladprao area and toward Rungsit area in the following year. This new pipeline will facilitate the conversion of some existing CNG refueling daughter type stations in inner Bangkok to the conventional type by PTT. A medium size LNG production plant, 25 mmcfd, will be constructed in Rayong province by mid 2007. The LNG product will be distributed to LNG storage depots which will be located in all regions and to facilitate LNG supply to refueling stations throughout the country. At that time, Thailand can become a focal point for creating an Asian “Blue corridor” through adjoining countries, i.e. Malaysia, Singapore, Vietnam etc., to facilitate NG vehicles to run around Asia. The increased number of NGVs will come from both retrofitting in-use vehicles and OEM vehicles. Trucks, inter-provincial buses and pick-ups will be encouraged to convert to run on diesel/CNG dual fuel, while Bangkok city buses will be persuaded to convert to run on dedicated CNG. The existing policy of promoting bi-fuel, CNG and gasoline fuels for cars will be maintained. Phase 2 (2009 – 2016) NGVs will be promoted throughout the country, the natural gas supply to refueling stations in the areas that have no natural gas pipeline will be in the form of LNG and in the form of CNG where natural gas pipelines exist. The implementation plan to import million ton per day of LNG 5 in the year 2010 is still active. PTT is expecting to have 500 service stations serving 265,000 -503,000 vehicles by the year 2016. – Gold Card : For those who do not have any loan liability, they will pay only CNG price. loan for taxis. Taxi owners will re-pay their loan at 3 Baht per kilogram of CNG every time they refill their CNG tank. – Orange Card : For governmental organization’s vehicles, PTT pays all the conversion costs for them which are then re-paid at 5 Baht per kilogram of CNG every time the converted vehicles refill with CNG. powered vehicle conversion up to about 500 vehicles this year. 3. PTT will expand the NGV service station network by constructing more CNG service station along main highways and gas distribution pipelines, and also in industrial estates where natural gas pipelines exist. – Grants to BMTA and BMA for additional cost of purchasing NG Vehicles instead of diesel powered vehicles. 2. Creating price advantages for natural gas by maintaining current pricing structure for refined crude oil products which are imposed with excise tax, municipal tax, oil fund levy and energy conservation fund levy as well as VAT, while natural gas is exempted from any taxes, except VAT. This pricing regime allows natural gas vehicle fuel to be priced lower than any other fuels (about 50% of diesel price). – Vehicular conversion kit: Equipment 1%, NGV cylinder 1% for all material types. 5. Revising existing natural gas powered vehicle regulations to accommodate the latest NGV technologies. 6. Introducing new BMTA buses and garbage collector trucks to use NGV. 7. Developing NGV refueling station regulation. 8. Allocating land for NGV service stations. 9. Setting NGVs as the first priority for natural gas use, especially gas from onshore fields. There are many continuing projects and pilot projects that PTT will implement this year to expand the number of NG Vehicles such as a pilot project for truck tractors/bus/van to use both dedicated and diesel dual fuel technology. This particular aspect will be emphasized in a number of unique highlight projects. Three projects will be explained in detail as follows. operating the engine without operator intervention. It uses sensors to detect the necessary operational variables to determine when the operation in dual fuel mode is acceptable. The system, of course, may be switched to only diesel mode if desired and is fully fail safe. In the event of power loss it switches the engine to diesel while still generating electrical power. The dual fuel mode of engine operation is nearly identical to the diesel mode. supply to the locomotive under certain conditions. It is designed for 3,600 psi maximum supply, delivering heated gas at approximately 25 psi to the locomotive. It is designed to deliver the necessary gas flow when supply pressure (tanks nearly empty) is only 150 psi. It is designed to be located on the fuel tender car. Along with the PRS are quick disconnect fitting sets for connection of the tender car to the locomotive. The commissioning is expected to be on August 2005.
of running out of natural gas in the ocean during fishing operation. The conversions will complete in July 2005 and their evaluation will follow. 3. LNG Plant and LCNG Service Station Project PTT are supervising one local company (Cryotech Co.Ltd.) to set up the first LNG plant in Pitsanuloke, 300 km north of Bangkok using gas from Nongtoom Oilfield owned by PTT Exploration and Production Plc. (one of PTT’s subsidiaries). The plant is designed to produce LNG at 16 tons/day by using feed gas at 1.5 MMCFD. The LNG product will be transported in a special truck to the refueling stations, so called “LCNG service station”, that has a vaporizer to change the liquid to gas. A conventional absorption process as well as low temperature technology (Cryogenics) will be used to purify and liquefy associated gas from the oil well. Gas containing hydrocarbons and impurities, mainly carbon dioxide, will be treated in a structured packing column and dried in a molecular sieve bed. Sweetened gas will be cooled in a high efficiency brazed aluminum heat exchanger. Heavy hydrocarbons in the gas will be condensed and separated by its boiling point temperature. The condensate is then boiled and washed in tower columns to make LPG. The main gas stream containing methane (over 90 mol%), is further cooled to –155 C and changed to liquid by a cold stream of nitrogen gas created from a cryogenic process known as Nitrogen Recycle System. The product LNG is stored in a double walled vacuum insulated vessel, waiting to be transported by semi trailer truck to the NGV refueling station. 1. A good start has been made by installing a sufficient number of refueling facilities to assure vehicle users of refueling convenience. 2. Following the government support measures and commitment, our NGV Roadmap is firmly in place. 3. After a long period of learning, Thailand has accumulated adequate experience and personnel for further development. 4. A fuel price incentive of more than 50% is attractive to vehicle owners for NGV conversions or replacement of their existing vehicles with NGVs. In addition, the reduction of import duties is another important incentive for switching from gasoline or diesel to NGV. 5. With a long history of safety in using NGV worldwide and successful publicity, the public perception has been positive. 6. The success of greater NGV utilization can only be accomplished by cooperation with other relevant organizations. 7. Having been through hardships in establishing NGV utilization, with a series of mistakes, Thailand has become one of the more experienced NGV implementers in Asia.